A line of cars were ticketed for expired license plate violations in mid-December in the 4500 block of North Albany, car owners said. 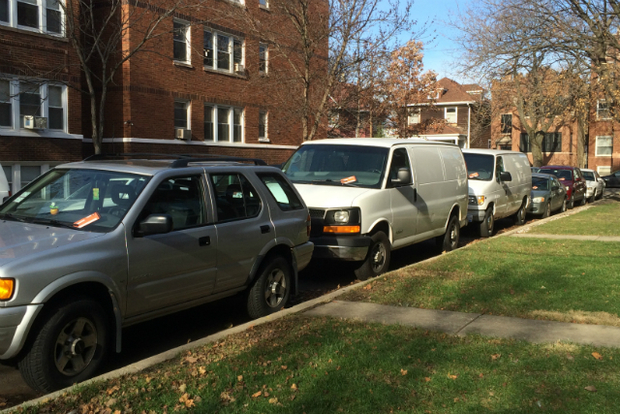 RAVENSWOOD MANOR — Illinois’ monthslong budget impasse has a new set of victims — thousands of Chicago car owners. Chicago drivers have been hit with a spike in parking tickets for expired registrations since the Illinois Secretary of State's Office stopped mailing out reminders to renew license plate stickers in the fall. According to city Finance Department data, city ticket writers wrote 4,230 more tickets for expired registrations in November and December of last year compared with the same two months in 2014. Expired registration violations rose from a combined 70,857 for November and December in 2014 to a total of 75,087 for November and December in 2015 — a 6 percent increase. With the violation carrying a fine of $60, the increase is turning into a mild windfall for the city, potentially adding $250,000 in revenue to the city's books. The story starts back in September, when the Illinois Secretary of State's Office stopped mailing renewal forms to vehicle owners. With Gov. Bruce Rauner and the Illinois General Assembly in a stalemate over the budget, Secretary of State officials say the agency could save $450,000 to $500,000 per month on postage costs by not mailing out the reminders. Officials said mailing license plates and titles took priority over sending the renewal notices, which cost $6 million a year. The mailers that usually go out in September and October were to remind vehicle owners with plate stickers expiring in November and December to renew. Since then, according to Secretary of State data, registration renewals have dropped dramatically. In November, renewals were down 16 percent, falling from 526,479 in 2014 to 445,116 in 2015 — a difference of more than 80,000 vehicles statewide. But December’s numbers were down even more. About 150,000 fewer motorists, 482,000, renewed registrations last month, a 24 percent drop from 2014. The drop in sticker renewals is also having a financial impact. With renewal fees starting at $101 per car, the state is forgoing — or having to waiting longer for — about $23 million in revenue. The cost of renewal goes up by $20 for those who don't renew within 30 days of a license plate expiring. Ravenswood Manor resident Mark Roeser is upset he didn't get a reminder from the Secretary of State's Office. One of his vehicles was hit with a $60 ticket because his plate sticker had expired a few days earlier, and he was one of many in the neighborhood who got pegged for the same offense. Tickets for expired license plate registrations have risen since the state stopped mailing out renewal notification to save money last fall. Without the notices from the Secretary of State, he said parking tickets are now the harsh reminder to drivers who have relied on the state’s annual mailers in the past. “A large number of people without reminders are not getting their renewals and are susceptible to getting a ticket,” said Roeser. Roeser said the state should do more to let drivers know their stickers are expiring. Druker said there are other ways for vehicle owners to know when it’s time to renew their plates. He said the registration paperwork that drivers should keep in their gloveboxes have the renewal date, as well as the plate sticker itself. The Secretary of State's Office is encouraging drivers to take advantage of what the agency calls its Green Mail Paperless License Plates Renewal Notices. They were rolled out two years ago and allow drivers to sign up to have the Secretary of State email vehicle owners reminders of when it's time to renew. Over 1.5 million people have signed up for the service, Druker said. 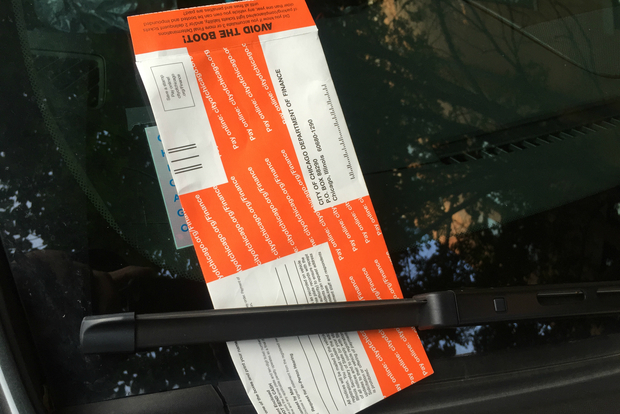 The city's Finance Department, which is responsible for issuing parking tickets, was hesitant to attribute the increase in ticketing to the Secretary of State suspending the mailers. "We haven't dug into it to figure out if that's what's going on," said Finance Department spokeswoman Molly Poppe. "A six percent increase is not a huge increase, but it's a large enough increase where it's something we're going to have to look at." Druker said the Secretary of State may resume mailing out reminder notices — but it won’t be until after a budget is approved. Vehicle owners can renew their license plates on the Secretary of State website, or renew in person at one of the agency's driver services facilities or at a local currency exchange.